Deep in the Googleplex, the highly secretive technology research division Google X are coming up with all sorts of weird and wonderful things that Google believe will improve our standard of living or how we physically integrate with the online world. The latest project takes to the air, called Project Wing, it’s been running in secret for two years now but Google say their long term goal is to develop drones that could be used for disaster relief or to deliver aid during famines, earthquakes, extreme weather or wars. Astro Teller (apparently that’s his name), Captain of Moonshots which is Google’s name for big idea projects said “”Even just a few of these, being able to shuttle nearly continuously could service a very large number of people in an emergency situation,”. 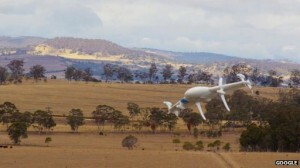 The prototype UAV, Unmanned Aerial Vehicle has been tested in remote farms in Queensland, and allows goods to be moved between neighbouring farms. The drones can be pre-programmed with a destination and then left to get on with the flight themselves. Google even suggest that the unmanned flying machines could eventually be used to deliver shopping much like the Amazon Prime Air service which hit the news last year and is still waiting for permission from America’s FIA to begin tests.